THOUGHTSKOTO Thoughtskoto : OFW That Is Struggling Financially? Maybe You Are Committing These 8 Mistakes! OFW That Is Struggling Financially? Maybe You Are Committing These 8 Mistakes! There are more than 2.4 million Overseas Filipino Workers (OFWs) in the whole world base on 2015 Survey on Overseas Filipinos according to Philippine Statistics Office. But with this number, only small portion are financially stable and can return home anytime for good. According to 2011 study conducted by Social Enterprise Development Partnership Inc., one out of 10 OFWs are financially broke. In addition, eight out of 10 of those who return to the Philippines have no savings. OFWs are being called as modern-day heroes because of their remittances that keep the Philippine economy afloat. But despite working abroad for many years, few are able to save a substantial amount of income. 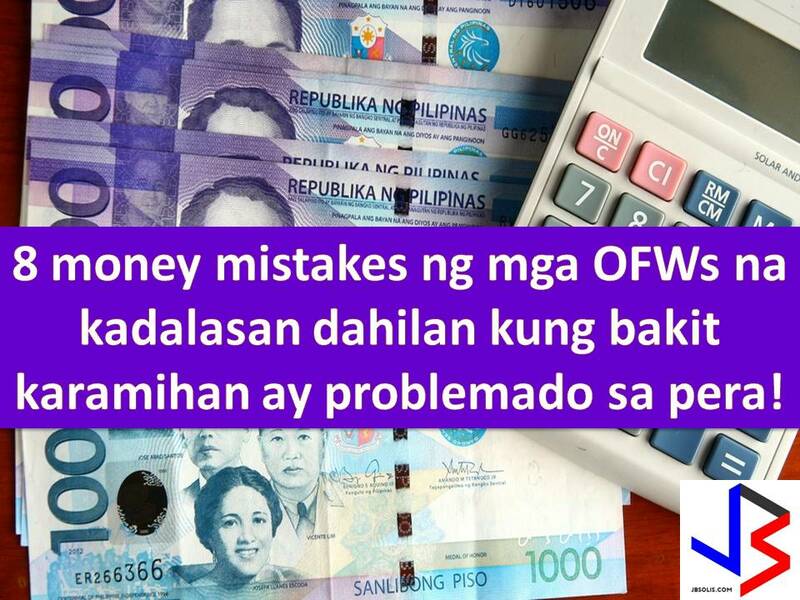 But it is a challenge to OFWs on how to handle their own finances and many are struggling financially because of common money mistakes they commit. If you are an OFWs who is struggling financially, you have to start avoiding these eight money mistakes and aim for financial success and stability, not just for you but also for your family back home. As an OFW, we only save whatever is left on our salary. This is after sending our remittances to our family back home, paying all the bills that we need, such as internet, rent and food allowance. If nothing is leftover, we have no savings at all. If you want to break this habit, pay yourself first. Set aside for savings before paying your bills or sending your remittances home. Saving at least 20-30 percent of your monthly income for your future is not bad at all. Because many OFWs fail to define asset versus liability, they often purchase liabilities, which they think is an asset. Robert Kiyosaki emphasized asset as anything that puts money in your pocket, while liability takes money from your pocket. An asset generally increases its value over time or it has a potential to gain yields in the future. An example of a good asset is when you purchase a real estate or condo unit that can translate into rental business. However, you need to consider several factors such as the location, time frame of finding a renter, the reputation of the developer, and the payment or financing options before you make the big decision of buying a unit. This is a very common money mistakes for OFWs. They put their hard-earned money in the wrong kind of investment. Many are being tempted by high returns, even in such a short period of time. You must be cautious when an offer is too good to be true; because unfortunately, it’s probably not true. In the Bible, here's King Solomon advice in terms of money management, "Dishonest money dwindles away, but whoever gathers money little by little makes it grow” (Proverbs 13:11). Helping your loved ones is the reason why you are working abroad. There is nothing wrong with this. But remember, family back home should not too financially dependent on OFWs just to be always "in" or to keep on trends. Learn how to say "No", unless it is an emergency that demands financial support. Learn to save for yourself and avoid over-remitting. You will not be a burden to your loved ones when you retire financially stable. Remember, planning for your own future is also one way of helping not just yourself but the family as well. This mentality can certainly affect your budgeting and ruin your finances. You can avoid or say "No" to a friend, or a relative that comes to see and offer you something. Sometimes, even OFWs budget is tight, they say "yes" because its "nakakahiyang hindi kumuha o bumili ng mga bagay na ino-ofer sayo"
There are many investment opportunities for OFWs including real estate, trust funds, business ventures, mutual funds, a stock market, bonds, and others. However, they do not invest due to lack of knowledge. On the other hand, some OFWs have the desire to invest but they don't know where and how to start. I believe financial education should be the first priority of any OFW. Once they have the knowledge, they will be able to put their hard-earned money in the right investment instruments. Furthermore, financial literacy is the best weapon against any form of scam or other related fraudulent investment scheme. Before flying abroad, it is important you have a plan ahead. If you want to buy a house and lot, put up a small business, or help your siblings finish college, you have to set goals. Regardless of the intended number of years working abroad, setting realistic financial goals will put you in a right direction and avoid wasting a great deal of time as you work overseas. While still receiving a good salary, OFW must take advantage of saving or investing. Another reason why many OFWs are struggling financially because they do not have an emergency fund. When critical illness happens or being laid off from work, they become devastated. As a result, they are forced to borrow money or loan from friends, or from their company. Due to high interest, OFWs are left in huge debt. As OFWs, we can avoid these money mistakes so that we can save and invest for future, not just for ourselves but also for our families. Who wants to work abroad for life anyway? OFWs wants to return home as soon as possible and to be with their loved ones.